Posted on October 12, 2013 by Veena S.
Quilting is my companion, it relieves stress, brings beautiful and fond memories, and stirs the mind to create something different. That is what I wanted to do – make a unique quilt for my grand-daughter ! So everyday, after finishing housework, I sat quietly on the apartment balcony, sipping some warm tea, singing and chanting hymns as I quilted. I wanted my grand-daughter to have something to cherish, to learn, to share with her friends as she grows, and then begin to value the patience and labour gone into quilting. Patience…..almost a lost word for the young generation, isnt’ it ? 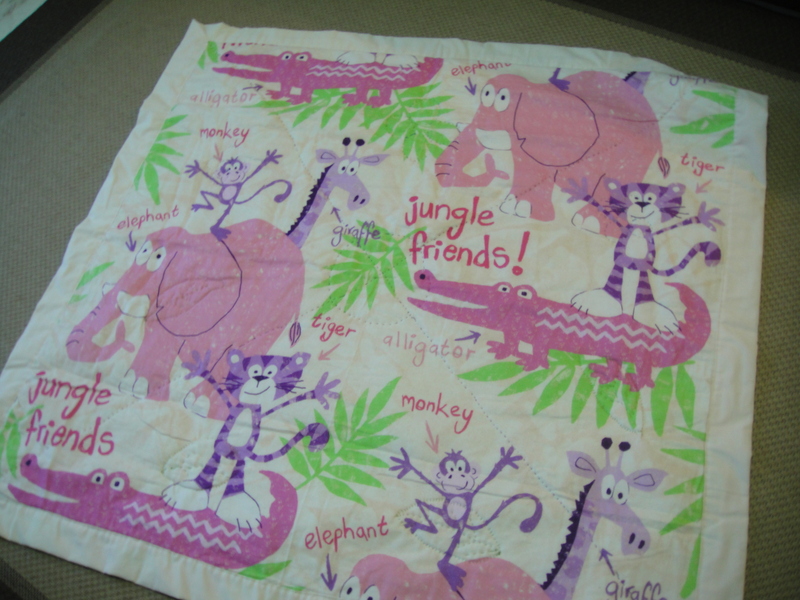 I planned the baby quilt with Alphabets and corresponding motifs – A for apple, B for bear, C for Cat , D for Duck – I used left over fabric pieces and hand stitched. Then, my daughter suggested – ‘Mummy, Why don’t you add something like Eric Carle’s theme ?’ So we planned to add numbers 1-10 and shapes. These were all made with baby’s out-growns dresses. The white all-round border is wider than the blue one. Final trimming is done with left over fabric and dress materials. Quilting was set 1 inch apart, starting from the centre of the quilt, then moving outwards into the four quadrants. And here is the final version – complete with Alphabet , numbers and shapes. I hope you like my innovative baby quilt. 1st year birthday gift for baby.